Zachary Strouse is an accomplished musician and music educator. 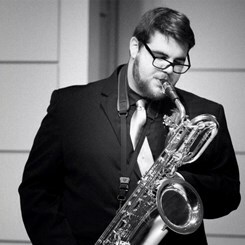 Graduating with a Bachelor’s of Music from West Chester University of Pennsylvania, Zach studied jazz saxophone to further his passion of creating and playing music. Zach has also played in prestigious ensembles during his collegiate career, such as the oldest college big band in America, the West Chester University Criterions. There he played for 3 years on baritone saxophone, and 1 year as lead alto saxophone. Playing in this ensemble allowed Zach to perform with and be exposed to the teaching styles of many prominent modern jazz musicians, to the like of Randy Brecker, Delfayo Marsalis, Sal Lozano, Chris Washburne, Bobby Sanabria, and many more. Zach also performed in the West Chester University Wind Ensemble for 2 years on baritone saxophone, playing some of the most challenging repertoire for wind band, and even playing a piece commissioned specifically for the ensemble. Zach takes the teaching approach of nurturing a foundation to learning music, but also in a fun way that piques the student’s interest. Knowing that each student learns differently with a unique style, Zach helps to connect the student’s learning with their own personal interests in music, and connections to not only music, but to other aspects of everyday life to help understand music on a different level. Request Lessons with Zachary Strouse today!